Formed in the autumn of 1989, Pandemonium emerged from the same burgeoning Polish metal scene that spawned the likes of such greats as Kat, Vader, Imperator, Christ Agony, and Taranis. However, the sound that Pandemonium adopted was unlike that of any active bands at the time in their home country. Instead, it bore a much greater resemblance to a few core Western European acts. Most notable among these perceptible influences were their Swiss contemporaries, Samael, and, to a somewhat lesser degree, Obituary, Celtic Frost and Hellhammer. The relatively strong following that the band was able to attract even in the early days was in large part due to the fact that their sound was so unique at that time in Poland. Founded by original members Paul (guitars, vocals) and Peter (aka Zuber, percussion), Pandemonium added a third member, Simon (bass), for its first recording, a four-song demo that the band simply calls “Reh Tape,” but which is more commonly known as the “Pandemonium” demo. 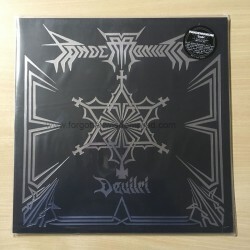 Recorded in 1991 within the familiar confines of their rehearsal space, this demo is comprised of three original compositions and a cover of Samael’s “Into the Pentagram.” Following this recording, Simon became a full-time member of the band and as a trio Pandemonium toured all over Poland and also played some gigs in Switzerland. This first recording, coupled with the live performances, served to raise Pandemonium’s profile, as several articles about the band appeared in underground metal zines and it had grown to become one of the most popular bands in Poland, alongside the aforementioned Kat, Vader, and Imperator. Although the self-titled rehearsal/demo is considered the band’s first recording, Pandemonium’s first official release, “Devilri,” was recorded in the winter of 1992 and was soon thereafter released on cassette by Carnage Records, a Polish label who had most famously been responsible for the release of Vader’s “Morbid Reich” demo in 1990. Since its initial release, “Devilri” has been reissued a handful of times by a few different Polish labels but to this point has not received the full recognition it deserves. Nuclear War Now! is proud to once again make this underappreciated document of Polish Satanic Death Metal available for only the second time on LP format. This second demo, but the first to be recorded in a professional studio, contains re-recorded versions of the three original songs from the first demo, in addition to four newer tracks. As those familiar with the first demo can attest, the significantly higher production quality of “Devilri” breathes new life into the reinterpreted tracks, as is perhaps best demonstrated on this particular rendition of “Might of the Godz.” The majestic forty-second intro that was added to this song for this recording best exemplifies the Celtic Frost influence on Pandemonium, as it is undeniably modelled after “Innocence and Wrath,” Celtic Frost’s intro to their masterpiece album, “To Mega Therion.” That curiosity aside, this demo stands strongly on its own, with its adherence to a doomier style of Satanic Death Metal than what became more widely popularized in the subgenre as a whole. The slower tempos, in combination with the deep, growling vocal style, effectively blur the boundary between black and death metal and thus bring the listener back to a time when such distinctions were not as easily defined. Although Pandemonium’s impact was not fully realized until the release of its debut album in 1994, “Devilri” is the recording that laid its foundation and thus strongly merits a revisit some twenty-five years after it was first unleashed.